Has anyone made their own sewing desk? Thread: Has anyone made their own sewing desk? Yesterday my husband, father in law and I worked on altering a table desk to set in my sewing machine (Juki 2000) and I'm totally bummed. 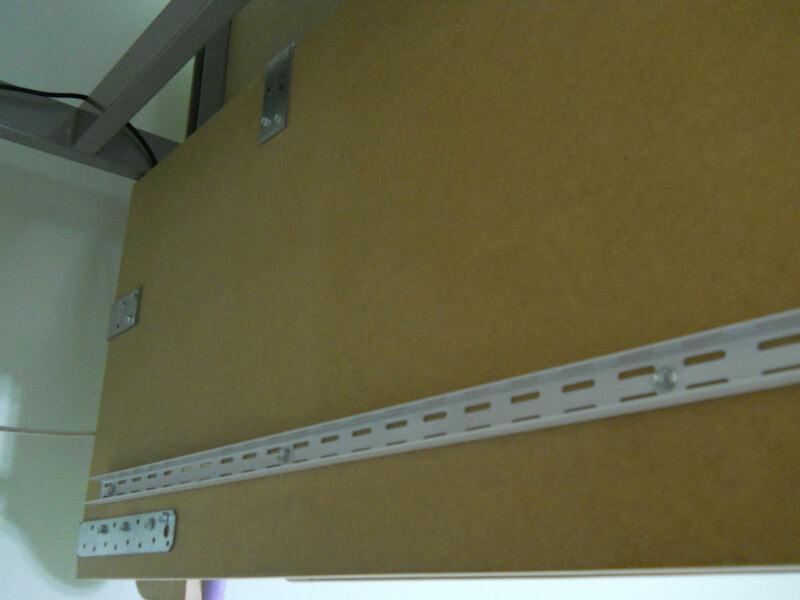 We then took out the drawer and used the metal drawer rails and put in a piece of shelving. It still vibrated too much. We then bolted the shelving to the conduit and it still vibrates and bounces too much.... then we gave up for the day. We'll have to try again another day. After my father in law left (he lives a bit over an hour away) I had a thought... why not add a 2x2 length of wood in the area where the drawer goes on both sides and attach the shelving to that We could countersink a bolt going through the desk top, through the 2x2 then through the shelving. That would make it so the shelving part would be secured to the desk top not the metal rails that are there for the drawer. We can't easily remove the drawer rails. They are welded on so they're going to have to stay where they are... I wish I would have thought of that before my father in law left. I might have a working set in machine now :'( I don't know when he'll be able to come back. My mom has used the cabinet from an old sewing machine for her new one ( just to sew, not to store) & you can get them for a few bucks. I think she had to cut some extra space for the plug ins.....but that was it. She puts another desk next to it in an L shape for cutting, pressing, whatever. Good luck!! 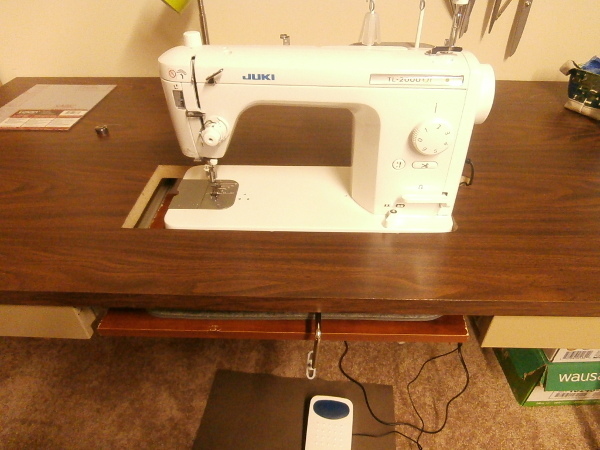 I use a desk from a yard sale for my sewing desk. I like using old or up cycling too! I bought a table top and separate legs from Ikea. Works fine. The table top measures 30x59. You can get smaller size tops if this is what you need. I have room for my cutting board on it as well. I made my sewing table from two cabinets from Lowes; I think they were $39 each. Wood across top w/cut out for acrylic insert from Dreamworld, shelf below to support machine. 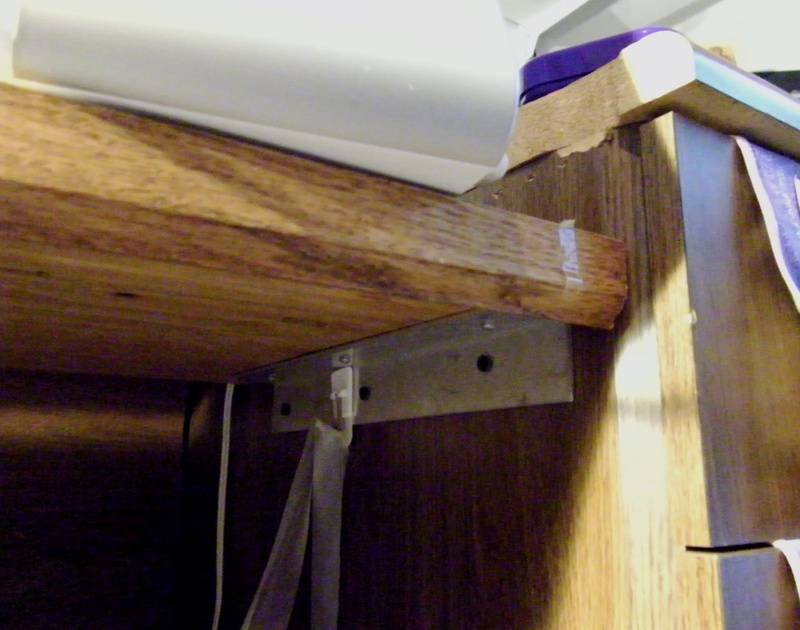 On each side is a wood strip running the width of the cabinet so that it could be screwed into the particle board side of the cabinet - the back of the cabinet was too flimsy to hold it. So then the shelf is attached to those. Maybe try some of that rubber shelf liner until you can work on your solution (which sounds like it should work). I think I've seen folks post that using that has helped. It's got a little bit of padding to it, that might absorb some of the vibration? 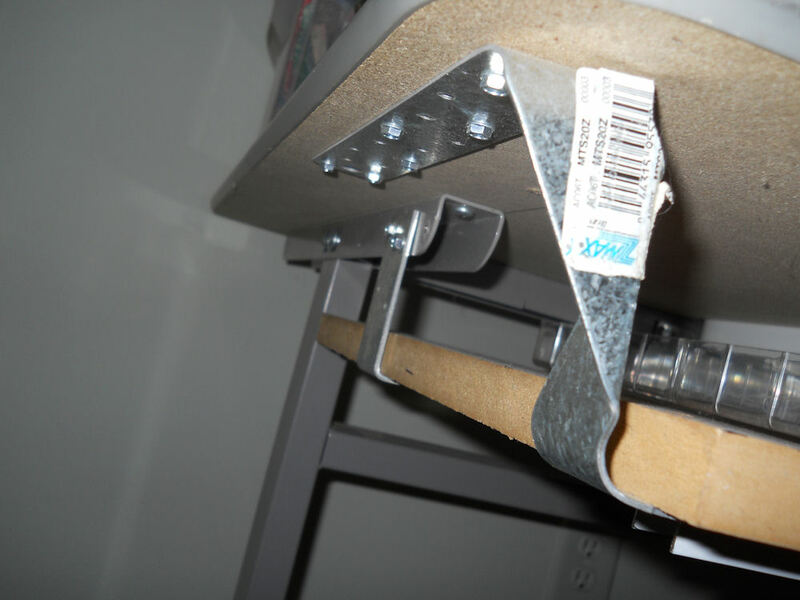 Probably just me, but I would add a "cripple" support under your shelf, just like they do in doors or windows to keep the shelf from coming down. 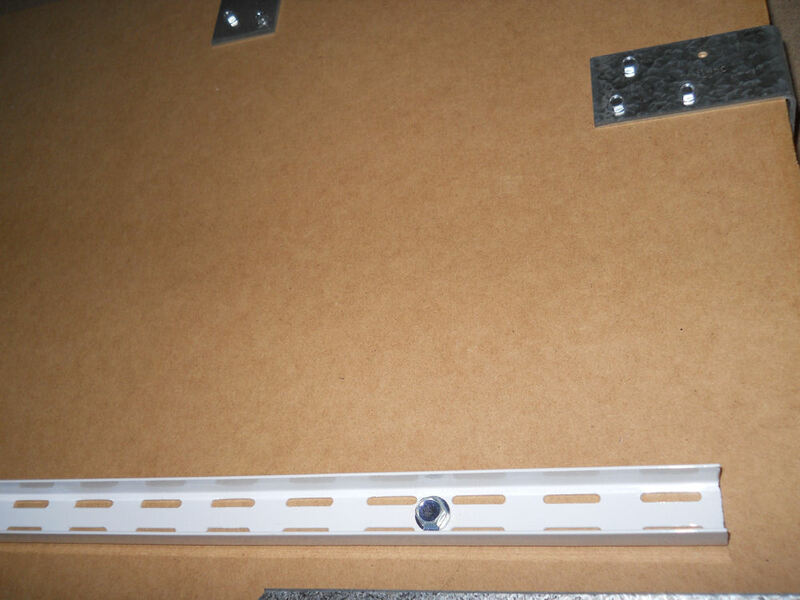 It doesn't have to go all the way to the floor, but it would keep your shelf from breaking loose & dumping your machine if the nails or screws work their way loose or the board possibly breaks in the corners where it is screwed/nailed together. Some of the inside molding for where ceilings meet walls would work too. Someone in the Juki 98 yahoo group suggested that I put shelf liner under it as well. I had to raise up the machine a bit anyway since it was about 1/4" too low.. it helped a lot.. so I put several layers under it and then realized that the back needed more than the front. I think the machine isn't quite level! That might be a part of it.. So then I looked around my room and saw the Janome under machine mat that I got when I bought my Janome years ago. That helped A LOT. It doesn't shake nearly as much as it did before. I then took it out and put it on the desk that I used to sew on (we couldn't use that one because we felt the drawer wasn't as sturdy as the one we cut up. wow. Never noticed just how much my machine liked to jump before. There is a certain mid range speed that I sew at that makes it dance. That Janome mat might just be what I need to fix the issue at least to the point that I can actually use the machine. I'm really happy - or at least much happier than I was when I went to bed last night. Here are pictures of what we have so far. 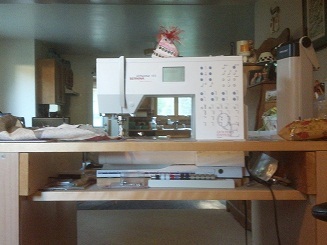 The machine is a wee bit too high (about 1/8") over the desk top after adding the Janome mat but I'm okay with that. We still need to cut and add the plexiglass to the left of the machine. I think this will work. I might look for a floor mat that is a little lower than the Janome mat so that the machine would be completely flush with the desk top but for now I'm just happy that it isn't making me dizzy from the bouncing when running the machine. The more you can cushion or secure your machine, the less it will vibrate. If you have a chance to try out a horn cabinet or similar, see how much they vibrate. It looks awesome and I would work around the vibration. My Husky 875Q vibrated alot in my Kangaroo sewing table, I put 2 or 3 layers of rug rubber pad beneath the machine, and the vibrations on minimal. Try that before you chuck the project. I also did this, plus got the drawer module to hold my scissors, etc. love it and no vibration. I might end up going to Ikea in the end... okay. That's just an excuse to go to Ikea. I love that place I'm going to give this a go first since I already had it. I'm going to give it a try today and see how it goes before we do anything else with it. 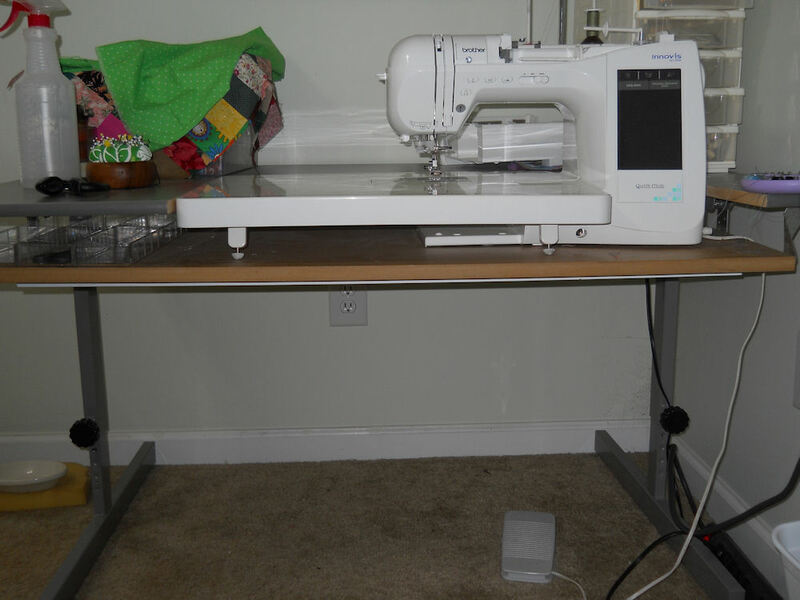 Don't be discouraged - it looks like an awesome sewing table and you are almost there! Your earlier thought about the 2x2s plus the cushioning may be the perfect solution in the long run. Glad to hear that it's workable now. Thanks so much I am going to call my father in law in a bit to let him know what I've done and the suggestions that were made. He was probably up half the night trying to brainstorm. I dreamt I was trying to escape from some weird installation full of aliens and aliens that look like humans. *shudder* I wasn't even watching sci fi before going to bed lol. Yours looks really good. Sorry about the vibration. My machine is heavy and has suction cups on the bottom, so the vibration is minimal. My Singer longarm has a kind of exposed frame on the bottom, so when it was vibrating, we simply screwed picture clamps onto the carriage and bolted the machine down. I'm not sure how you'd bolt or clamp it down with a DSM, though. "now that this one has a hole in it... it isn't exactly a usable surface for anything else so it will most likely have to get chucked"
You could always make the hole bigger, get a piece of clear plexi to cover the hole, and voila! you have a light table. How about covering the hole by adding a new top to the desk for a cutting station or a really oversize ironing area? Look in the carpet/throw rug section of Walmart, or which ever big box store you have, for a closed cell foam floor mat. They are like camping mats or exercise mats - which you could also use but you won't have as much waste with the floor mat. The floor mats are 1/4 inch thick and have pretty designs printed on them. I use one under my embroidery machine. I can embroider in the morning before anyone is awake, with no complaints about noise. Cut it to size. 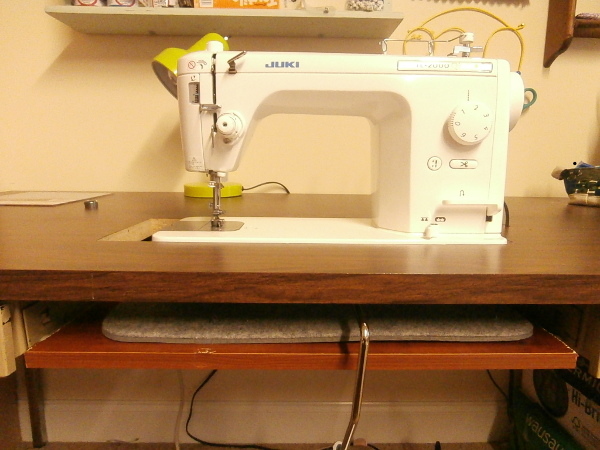 When sewing with my viking on a table top it loved sliding over he table . My solution a piece of that roll that stops things sliding on car shelves and made a small quilt to go under with thick batting. Stopping sliding but it is so quiet as the quilt absorbs the sound. Does your sewing machine have a "lip" on the edge of it? 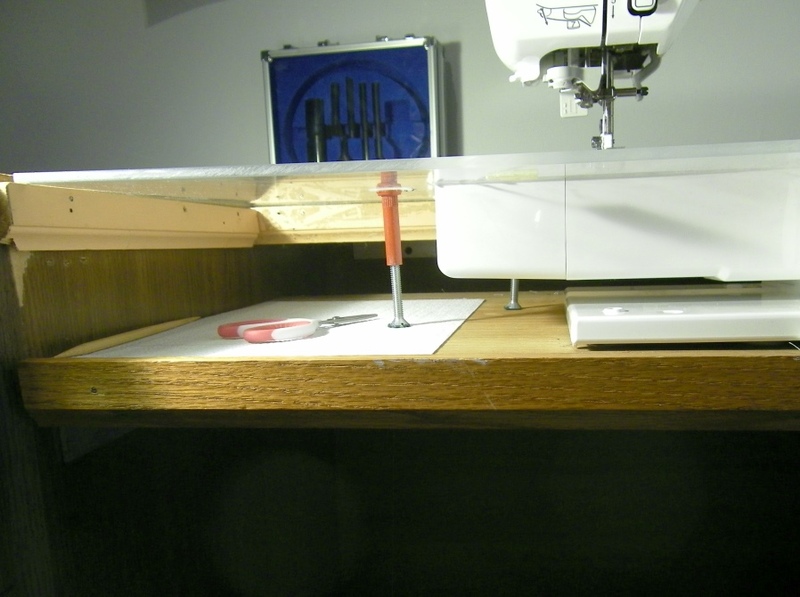 My sewing machine cabinet has a hinged section, so that you tilt the machine up, and fold the hinged section down, then the sewing machine sits on the table, not on a lower piece attached to the table. I've never had a vibration problem with the sewing machine cabinet/table. But I have had major vibration problems with a so called craft table made out of plastic. The table and machine jumped all over the place. I think your problem is lack of support on the surface where your sewing machine is sitting. Here's what my DH did to modify an old desk. He removed the drawer and mechanism. 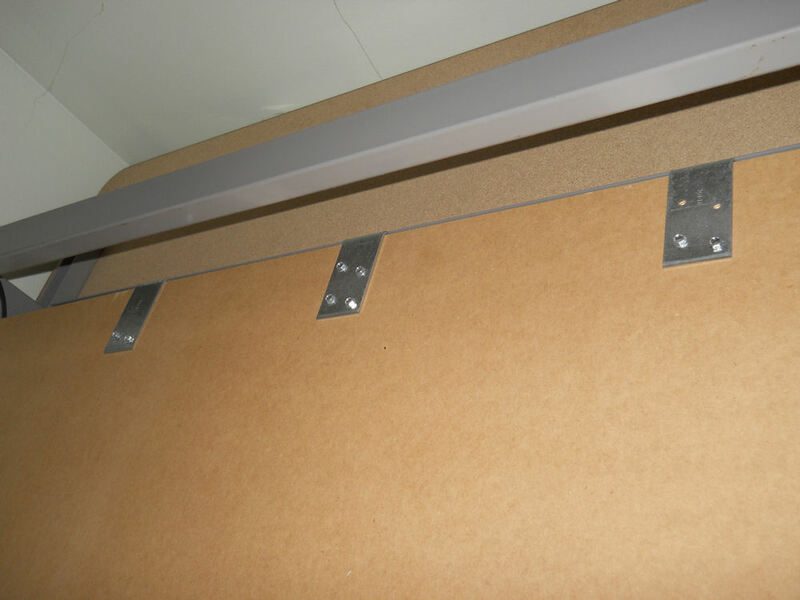 Being a carpenter, he was able to stabilize the machine shelf using metal L brackets (I think that's what they're called). Here's some pics that might help. Then we had a friend of ours make an acrylic top that fits my machine bed and the opening around it. It's not pretty but it's functional and so much cheaper than the actual bed inserts. I have a higher-end machine and it sews quite fast (not that I use it that way often) and have no problems with vibration. This is the table my brother put together for me It is very sturdy no vibration. I don't know how to put multiple photos in one picture so I apologize for so many but maybe this will give some ideas. Your problem is not at the machine, it is the desk itself. The desk was made to be light weight, so small vibrations are amplified throughout the desk all the way to the feet. Can't tell you how many of these desks I had to replace when I worked office management for Uncle Sam. Just the weight of files etc on them was destructive. Then people would decide to "sit" (semi-lean) on the edge and they would totally bend. Try adding weight down low on the desk legs, or perhaps extra legs made from 4x4 lumber. I did exactly what you did but with a plywood desk that has solid ends clear to the floor, and I have no vibration. Good luck.